What should I do if I have a question or comment for customer service? How do I get myself or my band endorsed with Ernie Ball/Music Man products? Thanks for your interest in a possible Ernie Ball/Music Man endorsement! We are very proactive in building the industry's top artist roster and would love to hear from you. We ask that you email an electronic press kit in to the following address for endorsement consideration: artistrelations@ernieball.com. Musicianship, an extensive touring regimen, and possible label/management support are indicators for endorsement consideration. 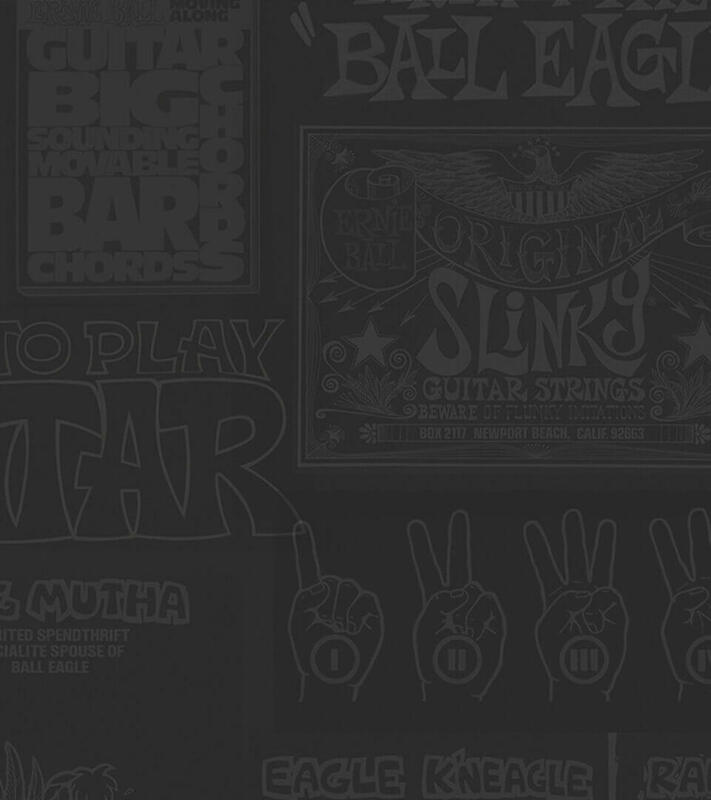 Artist Relations Staff Ernie Ball Inc.
Why don't you provide tension information for your strings? Although we do not have published tension values on our website, we are happy to assist you with any technical questions that you may have. In some cases, published string tensions can be misleading or inaccurate depending on the situation. String tension is only one of many important factors that can go into determining the right strings for your instrument and will differ based on scale length and tuning. Furthermore, the perceived tension can be quite different than the theoretical tension as a string's flexibility and responsiveness can be affected by even more factors including string construction, instrument setup, and bridge type. We err on the side of not oversimplifying each string to a number, but we are glad to assist you with these sorts of technical inquiries based on your individual needs. I experienced a problem with your strings. What should I do? Here at Ernie Ball we employ strict quality control standards and are committed to producing the highest quality musical instrument strings. Unfortunately there are many factors that can lead to a shorter string life. String attack, pick thickness, and finger oils are just a few factors that contribute to some players breaking more strings than others. Most strings break around the bridge. If this is happening repeatedly, you might need to replace the saddles. When the string is tightened, the saddle is the point at which the string makes the most contact and has the most tension, therefore needs special attention. If there are sharp or rough areas on the saddles (which are often difficult to detect), strings are much more susceptible to breakage. That said, we will gladly send you out a replacement if the string is determined to be defective. Please send the string(s) in question to: Ernie Ball Inc, Customer Service, 53-973 Polk Avenue, Coachella, CA 92236. Be sure to include your full name, mailing address, receipt copy and description of the issue with the string(s). What steps can I take to avoid breaking strings? We've written up a handy guide to reducing string breakage on our blog, click here to learn more. What gauges of strings does Kenny Wayne Shepherd use? Kenny Wayne uses 11-14-18p-28-38-58 . Sometimes he uses a 12 instead of an 11. All the plain guitar strings are reinforced (RPS Slinky singles, Reinforced Plain String). Ernie Ball PARADIGM guitar strings (pronounced “PAIR-a-DIME”) are the strongest, most advanced guitar strings known to man. Available in electric and acoustic varieties, they are also the first set of guitar strings to come with a fully-backed guarantee, meaning if your strings break or rust under normal playing conditions and within the first 90 days of your purchase, you’ll be eligible to get them replaced by Ernie Ball. Is Ernie Ball seriously going to replace my PARADIGM strings if they break or rust? Yes! But only if they have broken or rusted under normal playing conditions within the first 90 days of purchasing them. For example, you won’t be able to get a replacement set if you try to use them to tow your friend’s car out of a ditch or bring them snorkeling. Hold on a second, what are these strings made of, Adamantium? I know for a fact that I will be able to break these strings, with my wire cutters. What’s stopping me from getting free strings over and over again with my brilliant scheme? Again, the PARADIGM guarantee and replacement warranty is designed to cover replacement of your set if a string breaks or rusts within normal playing conditions within the first 90 days after buying them. In order to receive a replacement set, you will have to mail us the affected strings so our Ernie Ball “Pit Crew” can inspect them before we’ll send out a replacement. Snipping your strings is not only wasteful, you won’t be able to get a replacement - and maybe then you won’t feel so smart! So what do I do if one of my PARADIGM strings actually breaks or rusts under normal playing conditions? How do I get a replacement set? You’ll want to fill out our automated PARADIGM Replacement Warranty form located here: Paradigm Warranty. Once you fill in your info, we’ll generate a pre-filled PDF form for you to print out and mail in to your closest Ernie Ball authorized distributor, along with your affected strings, the original foil packaging, and your original sales receipt. It’s easy, just follow the instructions on the form. Do PARADIGM strings have a coating on them? Nope! Ernie Ball PARADIGM strings are treated inside and out with our proprietary Everlast Nanotreatment. It’s only 4 nanometers thin (over 20,000 times thinner than a human hair!) so there’s no way to feel it or see it with the naked eye. This treatment restructures the molecular surface of the wire and gives PARADIGM strings oleophobic and hydrophobic properties, meaning sweat and oils from your hands are much less likely to stick to the strings and gunk them up. This makes the strings last longer and sound fresher over their lifetime. Compared with other traditional coated guitar strings you may have seen on the market, they sound and feel like there’s no coating on them at all - there’s no dampening of high-end frequencies and no flaking or shedding after heavy use. I live outside of the U.S.A., can I still get replacement strings? Yes, of course! Just visit our automated PARADIGM Replacement Warranty form located here, and make sure to select your country from the dropdown: Paradigm Warranty. That way, you’ll see the correct address for the Ernie Ball authorized distributor nearest to you. You’ll want to mail your return package there, please don’t waste money sending your package to us internationally! Once your claim is processed, your local distributor will mail your replacement strings to your address. I threw away my original retail sales receipt and/or the original foil packaging and/or the affected strings themselves. Am I still eligible for a replacement set if my strings break? All of those items are required in order to complete your replacement claim. Each set of PARADIGM strings has a unique Product Code printed on the inside front of the foil pack. You won’t be able to create your warranty replacement form without your Product Code. However, in some cases Ernie Ball customer service may still be able to help you out. You can contact them here. My PARADIGM strings didn’t come with a Product Code. What do I do if I need a replacement? Your Product Code should be printed on the INSIDE of the foil packaging that your strings came in, on the front side of the pack. It’s needed to generate your personalized warranty replacement form, which is required to complete your claim. In the unlikely event that your pack didn’t get a Product Code printed on it at the factory, you’ll need to contact our Ernie Ball customer service team here so they can further assist you. Are any other Ernie Ball strings covered by the PARADIGM guarantee? My sound is affected when I plug my tuner into the TUNER jack of my pedal. Is my pedal defective? No. Certain tuners can potentially affect the circuit. The Tuner itself is not "in" the signal path, but it is still connected to the circuit. A tuner with a low input impedance can potentially load down the signal, affecting the volume or tone of your instrument. We recommend experimenting with a different tuner. My volume pedal sounds scratchy. What should I do? It sounds like the potentiometer might need replacing. If your pedal is old or hasn't been used for a while, there might be some oxidation in the potentiometer. Often times you can work-out the scratchiness simply by rocking the pedal back and forth many times. Information on our rebuild program is addressed in a previous question. I recently had you guys rebuild my older EB Volume Pedal and the new pot does not distribute the volume like the old pot did. Is this correct? We have used at least 4 different companies to custom-build our potententiomers since the pedal's inception in the 70's. Since 1998, we have been using Tocos pots, which we feel are among the very best available today. However, they do have a different "sweep" than the older pots do. On top of the fact that potentiometers in general have very wide tolerances, the fact that upon rebuild we are removing one vendors pot and replacing it with another, there will be some obvious differences in the pedal's sound. Here's the scoop: we no longer stock the pots of old, not only because we can't get them, but also because we do not think they are as consistently good as the Tocos pots. The Tocos pots are the most consistent, high quality pots we have tested. With regards to the sweep changing, that is due to modern day pot manufacturing techniques that are used across the industry. Can the Ernie Ball Volume Pedal be used as an expression pedal? Normally the answer is no. Our volume pedals very simply require a signal input into one jack and an output is sent out of another jack. Most expression pedals are sent a single TRS cable from the device it is to control which both sends and receives an electronic signal. These are two markedly different functions and one cannot be substituted for the other without intense modification. An expression pedal controls the amount of voltage that allows certain functions, such as, delay, distortion levels, volume, etc. in a keyboard or an effects processor to perform to whatever parameters the user sets it up to do. Our pedal may work as an expression pedal, but the manufacturer usually suggests what type of pot needs to be used, 500k, 250k, 25k, etc. in a pedal, keyboard, or an effects processor. The pedal might require a more sophisticated design. It is best to contact the manufacturer to determine what type of pedal is necessary. What are the values of the potentiometers that you use in your pedals, and are they audio or linear taper? What changes have been made to your volume pedal line? I understand that in 1998 they went through an almost complete design change. Some of our old style MONO pedals were fit with a taper pot on the side, which gradually modified the taper of the volume pot. In 1998, these taper pots were replaced with a taper switch, which you can now find in all of our 250K mono pedals. This switch was designed to enable the user to choose between the 2 best sounding tapers available in the previous models. Some of our old style STEREO pedals were fit with a minimum volume pot on the side, which set the volume level of the pedal at the sweep's minimum position. Sometime before 1998, the minimum volume pot was removed from the pedals. In 1995, the tuner jack was implemented into all of the mono pedals that can be found in our current line of VPs. Is there any way of adding the minimum volume feature that was on the old Stereo Volume Pedals? Unfortunately we are unable to add a custom minimum volume feature to our current pedal design. What are the dimensions and weights of your volume pedals? The VP's dimensions are approximately 11" x 4" x 2.75" and they weigh about 3.75 lb. The VPJR's dimensions are approximately 10" x 3.5" x 2.5" and they weigh about 2.25 lb. Can I interchange or replace the potentiometers in my EB Volume pedal with any other type of pot? For example, can I change a stereo pedal to a mono? How about using a different type of pot altogether? Replacing potentiometers with different values and/or from different manufacturers: For all of our pedals, VP and VPJR, unfortunately the answer is no. In our VP line, the MONO 250K pot cannot be replaced with our STEREO 25K pot, due to design differences in both the circuit and the potentiometer. As for the VPJR line, the 2 pedals were designed so that the user could choose the pedal they desire, and again, the pots cannot be changed due to design differences in the circuit. As for switching the pots between the 2 lines of pedals, this also cannot be accomplished due to size differences in the assembly components. Remember, if you attempt to modify the pedal in any way it voids all warranties! I have a guitar with a Piezo Acoustic pickup and a stereo output. Can a volume pedal be made with a single TRS input and dual outputs? Can it be set to simply blend between the 2 sounds? with toe or foot position closing out one or the other sound? When using our 6165 Stereo Pan Pedal, the A input/outputs are mono and the B inputs/outputs are stereo. If you are using a stereo cable, you should run the cable to the B side and then out both A and B jacks. You will be able to control both volumes simultaneously, or, when using the toe-tap switch, be able to pan the volume to each output. When would I use an "active" 25k pedal as opposed to a 250k/500k "passive" pedal, and why? Passive vs. Active: Whenever there is a passive signal leading into an EB pedal, the 250K or 500K pedal is recommended (mono VP & VPJR 250K and stereo 500K VP pedals available). Whenever there is an active signal (powered preamp in the instrument, effects loop, etc.) leading into an EB pedal, the 25K pot is recommended (stereo VP and mono VPJR pedals available). If an active signal is placed before a 250K or 500K EB pedal, or if a passive signal is placed before a 25K EB pedal, then the consequence may be that the swell of the pedal does not act as designed. Either way, as stated above, try whatever combination you desire, and determine if it works for you. All of our volume pedals are designed to be as transparent as possible in a signal chain. However, whenever you add any component to a signal chain, the signal will change whether it is audible or not. Keyboards are generally served best by the 25k pedals as well. What does the toe-tap switch on the #6168 pedal do? The toe-tap switch to which you refer on the #6168 is designed to replace an amp function switch, very often a channel selector switch. It allows a player, while he is already adjusting the volume, to perform a function for which a separate switch is normally needed. In addition, like our standard 6166 volume pedal, a micro-switch inside the pedal controls the sweep of the potentiometer. The pot has an audio taper, from the heel postion to toe position it has a gradual sweep of volume until the last 1/3 of travel, then the volume has a more dramtic increase. The micro switch gives the pedal a smoother, more gradual volume increase from heel to toe. What does the little switch in my 250k volume pedal do? It is a micro-switch that controls the sweep of the potentiometer. The pot has an audio taper: from the heel position to toe position it has a gradual sweep of volume until the last 1/3 of travel, then the volume has a more dramatic increase. The micro switch boosts the front of the sweep when switched to the left (or to the up-position on the 6180 VPJR), giving the pedal a slightly more gradual volume increase from heel to toe. I'd like to know detail features of the 6165 and 6168 pedals. And what are the differences? On the 6165, does it mean the volume pans left and right sides? And on the 6168 pedal, what does the switch actually do? Although they may look similar, the #6165 and the #6168 pedals are very different. The 6165 volume/pan pedal is a most versatile pedal. In addition to controlling volume, it can also pan a mono guitar to two separate amp rigs or separate channels and allow a player to "pan" between the two separate outputs. Example: being able to blend "clean" and "dirty" channels. It also has a stereo input to keep a stereo instrument truly stereo while allowing panning. Another use could be to control two instruments' volume simultaneously. A flick of the toe-tap switch changes the function from a volume pedal to a pan pedal. The toe-tap switch on the #6168 is designed to replace an amp function switch, very often a channel selector switch. It allows a player, while he is already adjusting the volume, to perform a function for which a separate switch is normally needed. Another difference between the two similar looking pedals is that the #6165 is a stereo pedal and the #6168 is a mono pedal. Explain the way the 6165 Volume/Pan Pedal works. In addition to controlling volume, it can also pan a mono guitar to two separate amp rigs or separate channels and allow a player to "pan" between the two separate outputs, for example being able to blend "clean" and "dirty" channels. It also has a stereo input to keep a stereo instrument true stereo while allowing panning. Another use could be controlling two instruments' volume at one time. A flick of the toe-tap switch changes it from a volume pedal to a pan pedal. Does Ernie Ball make a Wah pedal for Kirk Hammett in Metallica? No, he's using our Mono Volume pedal as a voltage controller for his Dunlop Wah rack effects. How much power does the MVP require, and what is the expected battery life? The consumption may vary due to use, but the MVP uses less than 3mA, which equates to between 200-300 hours of use with a standard 9v battery. Can I get my Ernie Ball volume pedal rebuilt/repaired? What is involved, and for what cost? Yes, most Ernie Ball volume pedals can be rebuilt/repaired* (All new pedals carry a 6 month manufacturer warranty). We offer two different services. With a Full Rebuild we replace the potentiometer, Kevlar cords, spring, feet, jacks, matting, bushings, and virtually everything except the outer casing. We even clean it for you! A Basic Rebuild includes string/spring and potentiometer replacement. With either rebuild we thoroughly test your volume pedal to ensure it once again works good as new. All rebuilds also include a warranty from the time of repair. Pedal rebuilds under our 6 month warranty are free of charge, but a copy of the original receipt must be sent in with the volume pedal. For all rebuilds you pay shipping to us, and we pay shipping back (U.S. only). We recommend shipping UPS. A typical rebuild is repaired and back on it's way to you within 48 hours of receipt. International customers please click here to get contact information for the distributor in your country. Our international distributors will facilitate pedal repairs. How do I go about ordering custom picks? To order custom imprinted picks check with your local Ernie Ball dealer. The U.S. retail list price for 100 picks is $50 with an additional $5 to cover shipping. That includes printing on one side, two lines, no more than 9 characters per line. They can be ordered through any music store that sells Ernie Ball products. Normal delivery time is 3-5 weeks. All picks are printed with your choice of three font styles; Century, Lucida or Corsiva. There are 7 solid colors available: white, tortoise shell, black, pink, red, light blue, and yellow; and 4 pearloid colors available: white, red, black, and blue. There are 8 colors of print available: gold, black, white, silver, yellow, red, blue, and green. These are available in 3 thicknesses: thin, medium and heavy. The picks are all standard plastic (cellulose nitrate). If you want more space 3-line picks can be ordered. The minimum for that is 600 and the U.S. retail price is $300. Another advantage is that the picks can be split into 3 thicknesses or colors of at least 200 of each type. A two-sided pick would cost 2 times as much as a standard one-sided pick. If you are unable to locate an Ernie Ball retailer, please let us know. We will help you! What size drill bit should be used when installing the amp casters? Use a bit 1/64” smaller than the target hole size for softwoods. Use a bit exactly the same size as the hole when working on other materials. If you're not sure which to select, it is always better to start small and work your way up. Can I tour your factory? Unfortunately, no, our facilities are not open to the public.